We all know it’s an unforgivable beauty gaffe to not exfoliate and moisturize regularly because beautiful skin starts with a good skincare regimen. However, the full beauty regimen might be absurdly time-consuming to city dwellers like us. 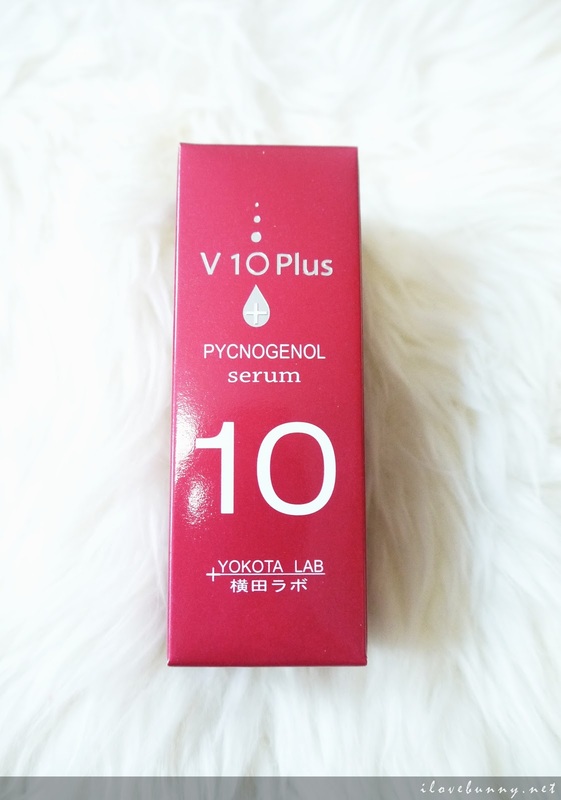 So popular Japanese skincare brand, V 10 Plus has come up with a few miracle serums that will help you curb your skin problems and shorten your beauty routine. Psst! Even Fann Wong is a fan. Click to read all about it! Yes. I’m not exaggerating. Here’s the proof! I’ve mentioned in this Mentholatum Organic Lipbalm review that many products (even those from top name brands) contain harmful chemicals such as thimerosal (mercury), parabens, petrochemicals, phthalates, synthetic colors, synthetic perfumes, diaszolidinyl urea, imidazolidinyl urea, diethanolamine (DEA), and triethanolamine (TEA) which may potentially be absorbed by the body through our skin. Research has shown that these chemicals may be linked to cancer, allergies, dermatological issues, organ failure, birth defects and many more health problems. Hence, I was very happy to learn that V 10 Plus products are free of parabens, artificial colors, mineral oil and chemical fragrance. And what made me even happier was – V 10 Plus approached me three weeks ago and asked if I were interested to try their products! I jumped at the chance and accepted their offer instantly. 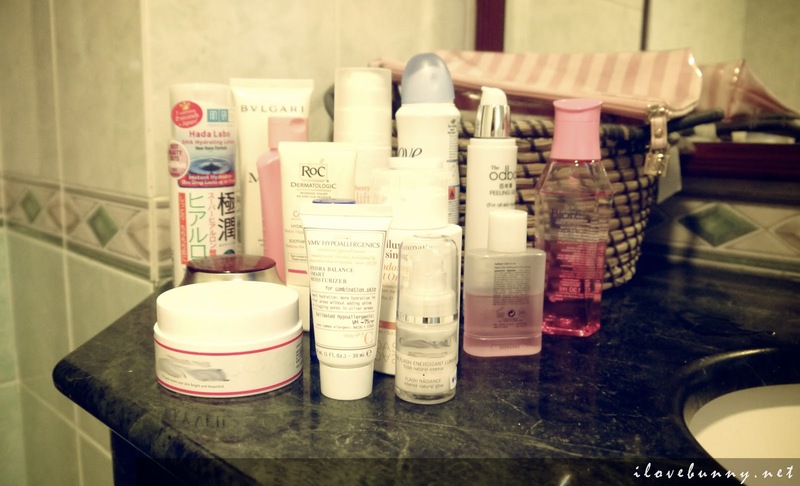 … my new skincare babies! Besides jazzing up my dull-looking bathroom with color, I thought the serum bottles also added some geekiness to the bathroom’s look. Haha! Doesn’t the eye dropper bottle design remind you of the iodine bottles in our schools’ chemistry labs??? There are 10 serums in the V 10 Plus serum range. Click here for info on the full range. Each serum caters to a different skincare need so we do not have to use all 10 serums to achieve flawless skin. I’ve received the following serums to sort out my large pores and blemish-prone skin. 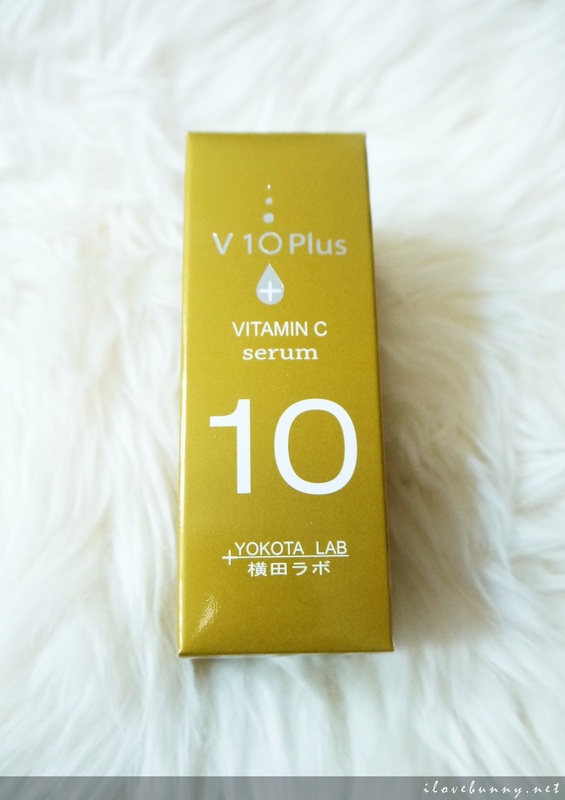 V 10 Plus Vitamin-C Serum contains OUBAKU EKISU (JTN) which is an anti-acne formulation that has been designed to provide relief for all skin types. It has many good effects on the skin. It helps the synthesis of collagen in the skin, so that the pores are minimized. It also improves inflammatory pimples. 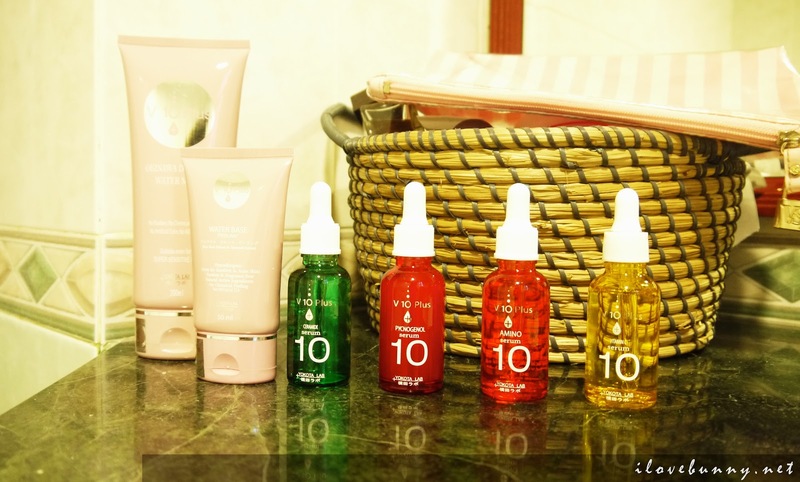 The Vitamin-C in v 10 Vitamin-C serum is a Vitamin-C derivative, which is stable and works efficiently. I use this ultra lightweight serum as a toner as it prevents acne and reduces the size of my humongous pores effectively. It has the lightest texture compared to the other V 10 Plus serums so I usually apply this serum before the others to allow maximum absorption. I use gentle patting motions to apply the product. The result? A refreshed look and feeling! Amino acid is the most important natural moisturizing factor (NMF) in the horny layer. V 10 Plus amino serum reproduces the relative proportions of 8 amino acids (glycine, alanine, proline, serine, threonine, arginine, lycine, glutamic acid) in the horny layer. It also contains 2 other amino acids: trimethyl glycine (high moisturizing effect) and ergothioneine (protecting effect). Amino acid is good for dryness. It moisturizes the skin with marine collagen and decreases the dullness by enhancing metabolism. My skin has been pretty dull and dehydrated lately so this Amino serum certainly came in handy. The texture is rather light so I’ll usually apply this product after the Vitamin C serum and before any other skin care products. Just one drop and I could see its good effects – skin felt firmer and looked plumper. 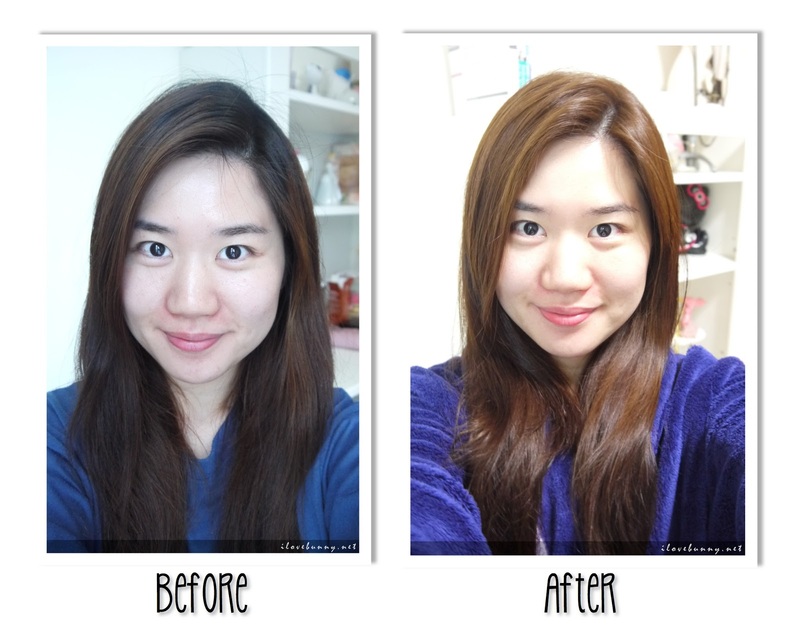 The best part is I did not experience any breakouts or side effects after use so 4.5 Honeyz crowns! Ceramide is a lipid which is found in high concentrations within cells. They keep water in the skin and also protects your skin from external stimulus, such as air drying or ultraviolet rays. Lack of Ceramide depresses the barrier function of skin and causes dryness and roughness of the skin. Ceramide is good for dry and sensitive skin. It fills in the damaged horny layer and enforces the barrier function of skin. 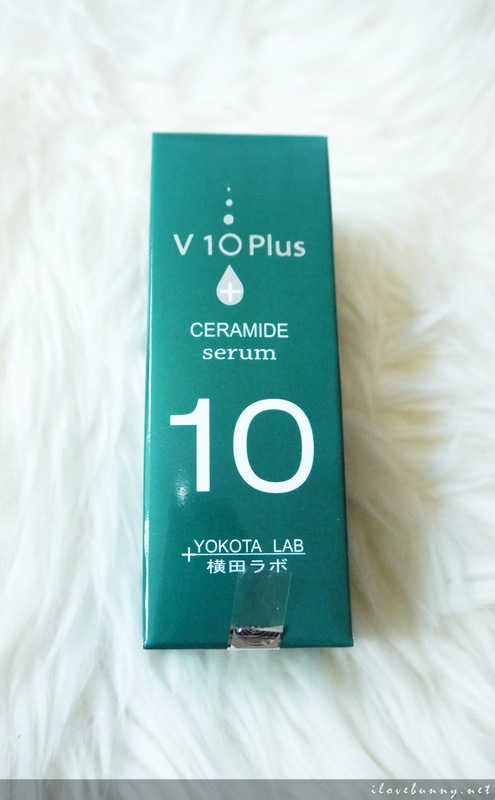 V 10 Plus Ceramide serum uses vegetable Ceramide, which is extracted from rice polishings. The Ceramide Serum has become an essential part of my skin hydration routine. Because of its thicker consistency, I do not pat it on like a lotion. 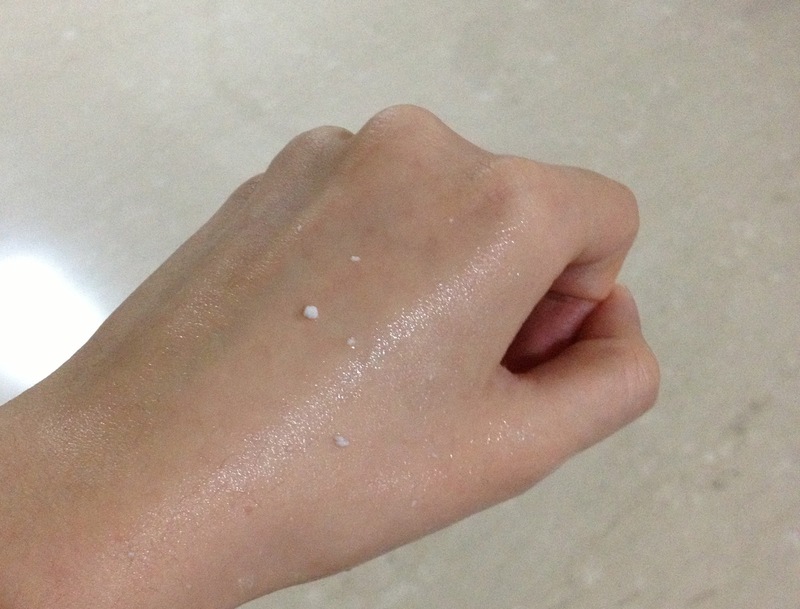 Instead, I smooth a thin layer of the serum onto my skin and wait for it to sink in before I apply the next product. Results are not immediately visible but after three weeks of continuous usage, my skin is noticeably smoother and softer. My skin also does not feel tight or flake as much as before. Pycnogenol is a natural ingredient extracted from the bark of the French coastal pine in Southern France (Bordeaux). It has a great antioxidant effect, which is 350 times greater than Vitamin C and 170 times greater than Vitamin E.
Pycnogenol is good for eliminating activated oxygen. It prevents your skin from any skin troubles caused by the activated oxygen and also rectifies damage. It also strengthens the effects of vitamins, collagen, etc. which enhances the benefits of your daily skincare products. This is the ultimate skin saver! As the product description claims, it intensifies the good effects of vitamins and proteins in all the skincare products that we put on our face to maximize the goodness of the products. So I’ll usually use this product the last to soothe and fortify my skin for a healthier-looking complexion the following day. I’ve been pretty reliant on my V10 Plus serums for my skin’s daily hydration needs so I’ve also brought them with me on trips! Their 30ml packaging made them absolutely aviation-friendly! 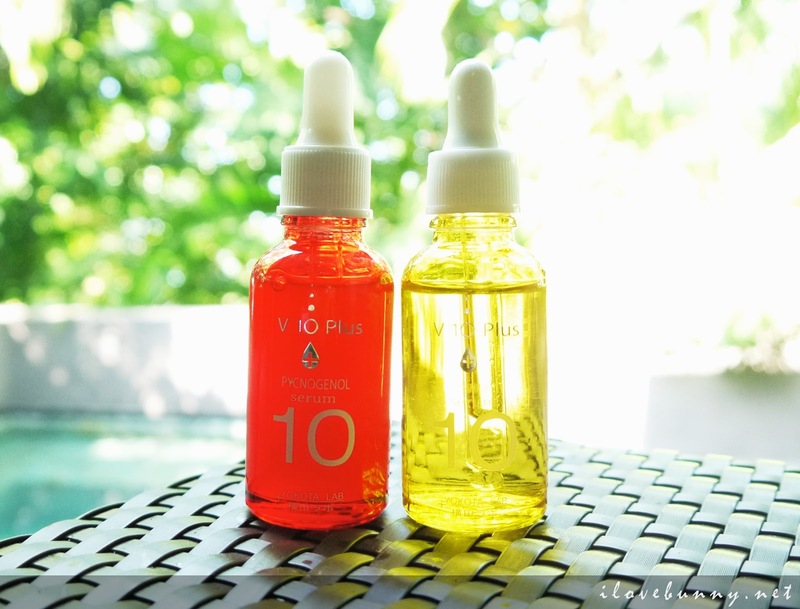 On top of the award winning serums, V 10 Plus also generously gifted me their best selling Water Based Peeling Gel to slough off the dead skin cells and their brand new Okinawa Water Mask to rejuvenate and revive my tired skin. This gentle peeling contains rice bran extract and seaweed extract. Without any harsh scrubbing, it effectively removes dead skin cells and reveals cleaner and clearer skin instantly. Directions: Pump an appropriate amount and leave it on cleansed and dry skin for 5 seconds. Then massage gently with your finger tips in a circular motion. Dead skin cells in the form of tiny flakes will appear shortly. Rinse off the flakes thoroughly with water. The water-based texture is no false claim. Unlike most peeling gels and scrubs that are harsh and aggressive, the product goes on the skin like jelly which felt absolutely soothing and comfortable on my skin. With small and gentle circular motions, the gel-like consistency quickly transforms into a light and watery texture and formed flakes that were supposedly dead skin cells. The light formula made it easy to rinse the product off my face. 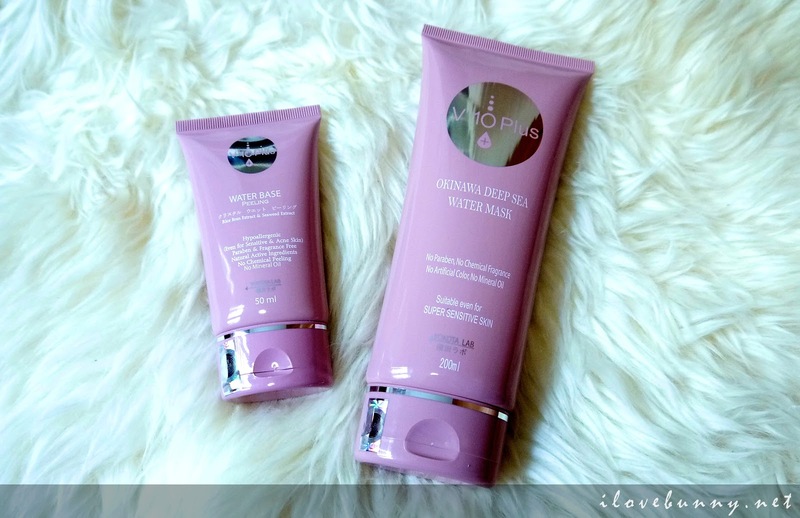 With extended use, I believe it will make my skin smoother, softer and more radiant. V 10 Plus Okinawa Water Mask contains sodium hyaluronate. A gel type moisture pack rich in deep sea water derived from the beautiful sea surrounding Okinawa (a Southern Island In Japan). It is rich in hyaluronic acid, seaweed extracts and minerals to hydrate the skin. It improves elasticity of the skin and protects the skin from dryness. it effectively tones and provides optimal hydration for the skin that has been severely affected by UV rays in summer or doing outdoor sports. 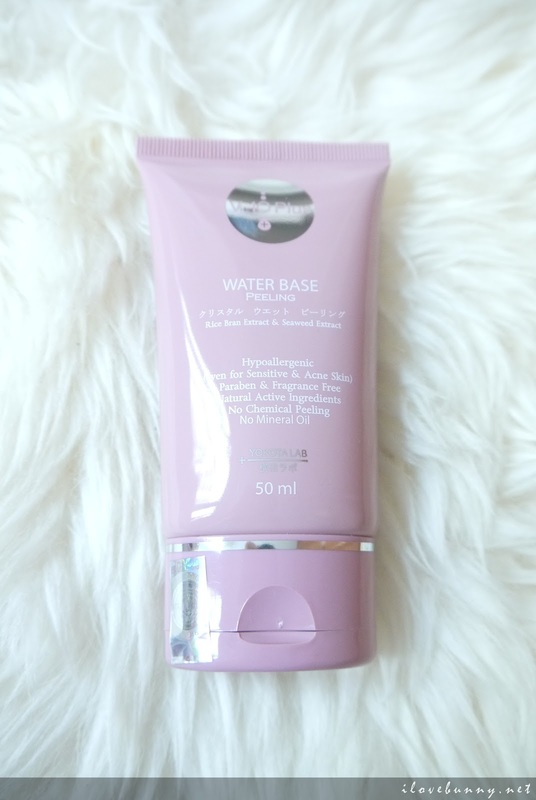 Directions: Apply a thin layer of water mask onto thoroughly cleansed face (including eyes and lip area). Ideally, you may leave it on through the entire night. Alternatively, leave it on for 20 or 30 minutes. wipe of with a wet towel and pat it dry lightly. Recommend to use it daily or 3 times a week. The thick transparent gel mask gave my face a cold sensation upon application. The hyaluronic acid and natural extracts from the ocean provided a calming effect on my tired and acne-prone skin. I thought it could very well replace my aloe vera gel to soothe rashes and skin after sunburns. 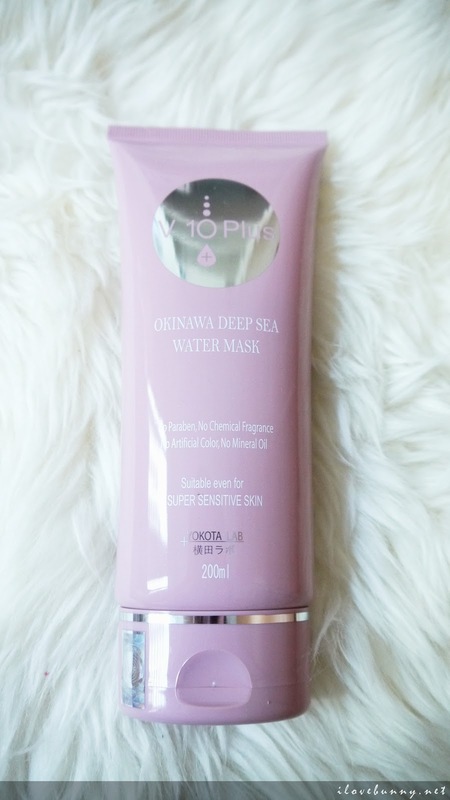 It also functions well as a sleeping mask when you leave a thin layer of the Okinawa Water Mask on your face overnight for a nourishing facial treatment. For its moisturizing properties and chemical-free ingredients, I award it 4 Honeyz crowns! After three weeks of continuous use, the serums defeated the enemies of my skin by shrinking the gaping skin pores and reduced its greasiness. Here’s a before-and-after photo for your comparison. Usually, I’ll pat on some foundation before I head out to conceal the huge pores and uneven skin tone. Now V 10 Plus has given me enough courage to leave the house makeup-less with renewed skin and confidence! 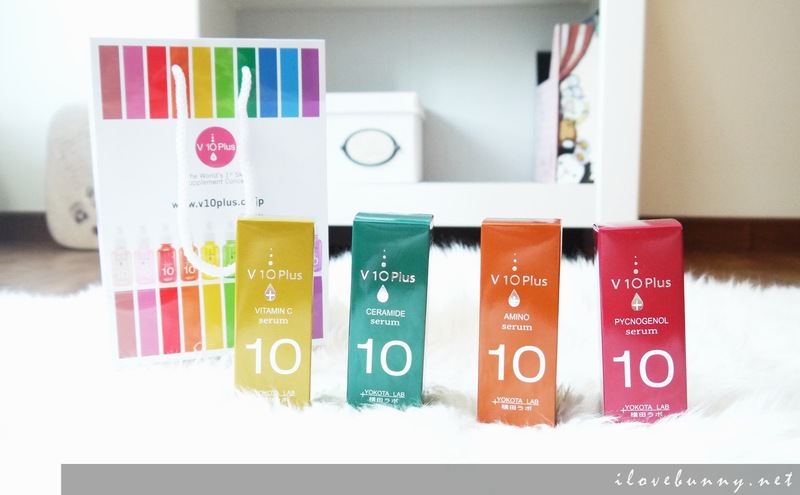 To get your hands on your favorite V 10 Plus products, visit their website at www.v10plus.co.jp for information on their products, store locations and promotions or like their FB page at https://www.facebook.com/v10plus for the latest V 10 Plus news. I’ve great news for you. 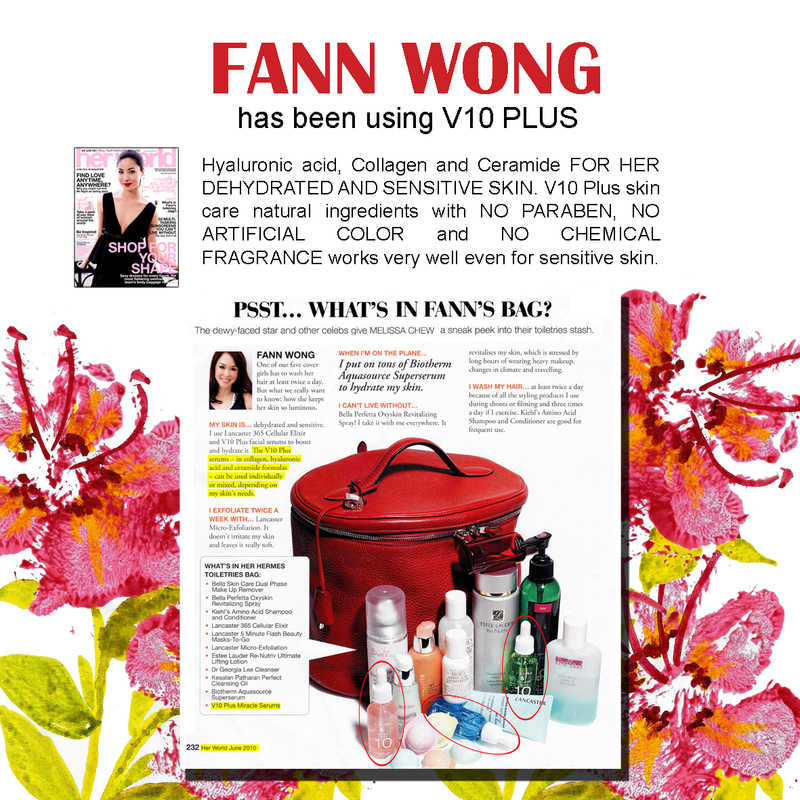 My beauty portal Honeyz Cube has teamed up with V 10 Plus to provide you exclusive V 10 Plus samples! Go to Rewards Catalogue to redeem your sample now! Psst! Don’t have enough points to redeem the V 10 Plus samples? Enter promo code* ‘honeyzbelle‘ when you sign up as a member at www.honeyzcube.com and earn 20 points instantly! *This offer is for a limited time only. Beautiful skin begins with V 10 Plus! ZALORA – Your Shopping Is Just A Click Away! 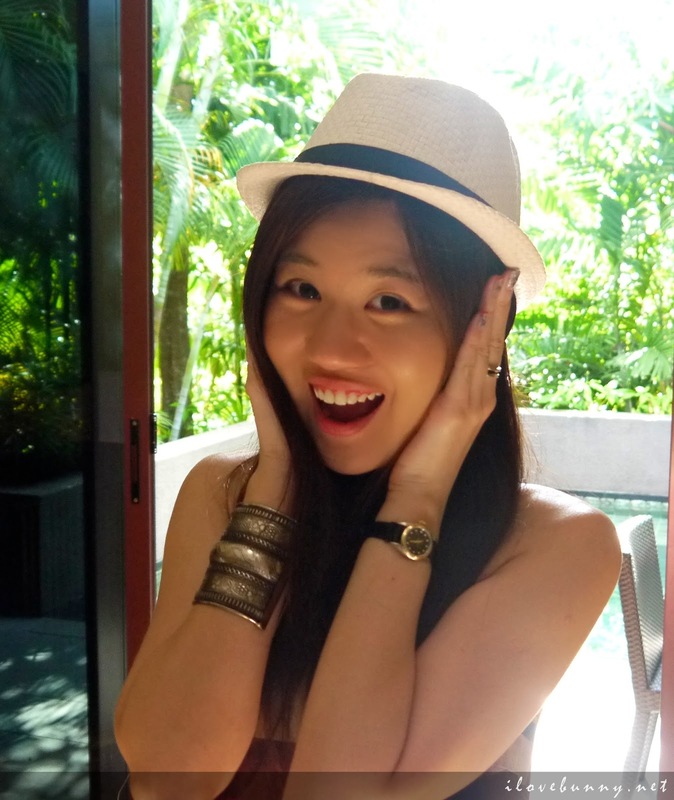 Beauty Review: Spa Symphony Super H2O Bian Stone Facial Treatment and Facebook Giveaway!